Multaja is an odds-on favourite to maintain an unblemished record when she races at Moonee Valley. Dwayne Dunn is excited about the prospects of returning to Moonee Valley to partner impressive last-start winner Multaja. The Godolphin filly attempts to keep her unbeaten record intact in Saturday’s MSC Signs Plate. A debut winner at Werribee in April, Multaja made an impressive racing return scoring over 1000m at Moonee Valley on August 4 with Dunn in the saddle. Dunn was taken by the win while also noting there was natural improvement to come as the filly sported a winter coat . “She smashed the clock,” Dunn said. “She had the right run in the race to really ping off the back of them and she ran right through the wire. 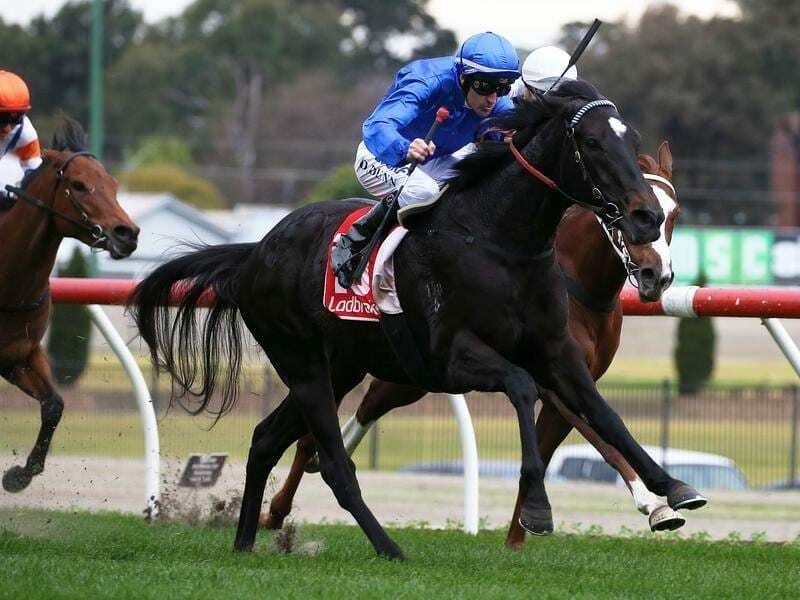 “Godolphin were thinking of running her last week in that race Sunlight won which turned out to be very strong. Bookmakers were impressed by the strength of Multaja’s win installing her the $1.50 favourite when markets opened, but have pushed her out slightly to $1.55 on Thursday. She sits on the second line at $17 in the Thousand Guineas on October 13 with Oohood and Seabrook sharing $13 favouritism. Dunn said Multaja had done everything asked of her since the return victory. “The stable says that everything they ask of her she steps up to the plate so hopefully she does the same on Saturday,” Dunn said. Godolphin trainer James Cummings says the stable is happy to be plotting a course away from the better performed three-year-old fillies at this stage of the spring. “The filly just wants to be tackling the low hanging fruit in the early part of the spring before we stretch her out over further distances when we get to better races later on this campaign,” Cummings said.